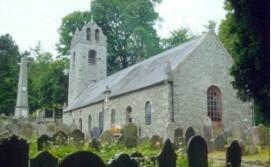 The old church at Kirk Braddan is just two miles from Douglas. It was the Parish church for the town until 1876 when the new church was built a hundred yards away. It is set in a very picturesque setting and dedicated to St. Brendan. It was erected on the site of an earlier Church and as built in 1773 probably using some of the stone from the previous church; modern opinion is that much of the original church walls is incorporated in the present stonework. Lighting in the church at first would have been by rush light and later on would have been by oil lamps . There has never been electricity in the church. According to the Rev. 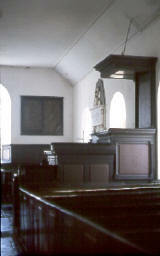 Brown in 1832, there were no cushions in the pews, no stove, no organ and no choir. The service was conducted half in Manx, and half in English. 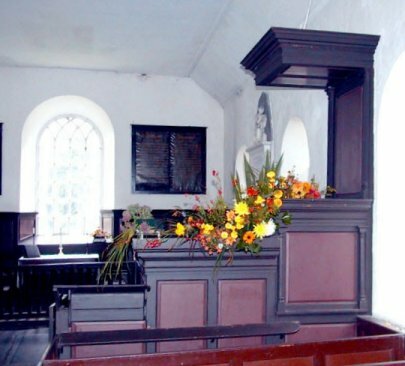 Outside, after the morning service the Sumner would mount a tombstone and announce first in Manx and then in English the fairs and auctions that were to take place during the following week. Visit the new church web site at http://www.gumbley.net/churches.htm from whence these pictures have been copied. The church is now showing signs of its age and unfortunately requires vast sums of money spending on it. In 1982, the Friends of Old Kirk Braddan were formed, and they helped to raise money for Its restoration. A new roof has already been put on, but there is still much interior work to be done, but the Church is being used again for special services. If anyone would like a booklet on the History of the Church , they are available at the cost of £1 .50p, and postcards with a print on by John Millar Nicholson for 50p, can obtained from Priscilla Lewthwaite, our Stray’s Co-ordinator (address on page 67) , all the profits from the sale of these items are to go to the funds needed for the Church. An extract taken from HUGH STOWELL BROWN'S reminiscences of services at Kirk Braddan Church. 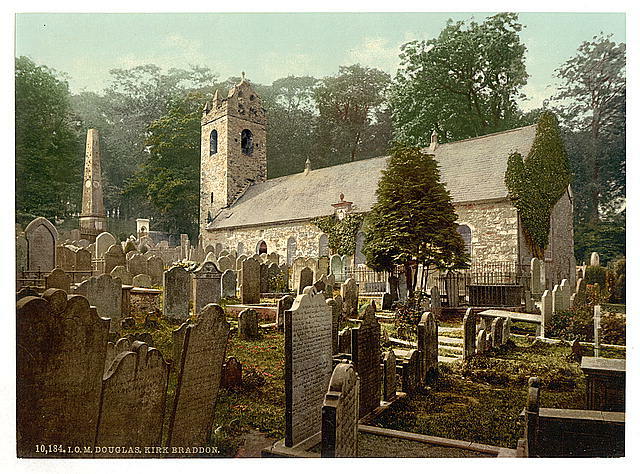 Then on every Sunday afternoon, funerals, for the Churchyard had to do duty for almost all the people of Douglas, as well as the other inhabitants of the parish. So the friends came at service time, the coffins were placed in the church, and remained there until the end of the service, perhaps an hour and a half I have seen as many as five at a time; and in hot weather, my father in the pulpit improving the occasion and we in a pew, within three feet of the coffins, were half poisoned by the stench. Many of the mourners were drunk, of course, and some of them in a state of stupor, tumbling over the coffins, sometimes sobbing and howling. Such was Kirk Braddan in 1832 and such or worse were almost all the parish churches in the Island. In Douglas in 1832 Cholera raged and there were often six or seven funerals in a day. 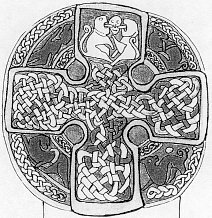 The Kirk Braddan Cross, preserved inside the church, and depicted on one of the Manx postage stamps.